The Brentham Society is a registered charity with an unusual history. 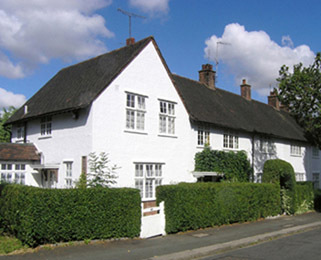 In 1969 Brentham Garden Suburb was designated a conservation area. The following year residents established the Brentham Society in order to encourage the preservation and improvement of the character of the suburb. In 1999, as Brentham approached its centenary, the Brentham Heritage Society was established as a charitable offshoot of the Brentham Society. Ten years later the Brentham Society was dissolved, reinvented and reinvigorated. You can find out more out the history of the Brentham Society here. The charity’s objectives and consititution can be found here. The Society's committee offers free advice to anyone thinking of making changes to their Brentham home, and it works with the planning division of Ealing Council to ensure that all developments or restoration works within the suburb comply with conservation rules and guidelines. The Brentham Society also organises a number of annual events that foster a sense of community and encourage an appreciation of Brentham Garden Suburb. These include fundraising and charity events such as a strawberry tea, an open garden day, carol-singing round the suburb, educational walks and talks, and an annual heritage outing. Among pojects to date are a centenary book, a resource pack for schools, a DVD and a photographic virtual tour. The Brentham Society maintains a rich historical archive. Membership of the Society is open to individuals and organisations that support its objectives. Click here to email the Brentham Society about membership.